This is a classic English pudding which simply screams summer! We're from New Zealand and because our Christmas is during the summertime this dish is commonly served up in our family as a Christmas pudding with cream and ice-cream. 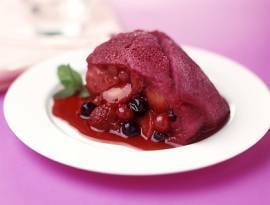 Other fruits may be substituted for the blueberries, blackberries or the red raspberries or the apple in this recipe, such as red currants, black currants, strawberries, plums, golden raspberries, etc. Pour the reserved fruit syrup into a pan and add the sugar. Stir over a low heat for about 3 minutes until the sugar dissolves. Then bring syrup to a boil and simmer for 10 minutes. Remove from the heat. Mix together the canned blueberries, blackberries, apple and raspberries in a big bowl. Cut the bread diagonally in half and arrange about half of it over the base and sides of a deep 20cm/8-inch cake tin. Brush the bread in the base with 4 tablespoons of the boiled fruit syrup. Spoon half of the fruit into the tin and then pour about 1/3 of the remaining syrup over it. Then place a layer of bread over the fruit, top with the remaining fruit and 1/3 of the syrup. Place the remaining bread on top of all this and cover with the leftover syrup. Stand the tin on a plate that has a lip. Cover the pudding with cling film (plastic wrap) and top with a plate and a weight. Set aside for an hour. Remove the plate and the weight and chill in the fridge overnight. When ready to serve, very gently turn out the pudding onto a serving plate and then decoratively place the fresh berries on top. Serve the pudding with cream or ice-cream if wished.